Unlike humans, plants only react to infections when they sustain specific kinds of damage. Now we know that the solution is to get them to produce special “decoy” proteins that can be damaged, in order to get the plant to spring into action. In a study appearing today in Science, scientists at Indiana University describe how they altered a plant’s genes to increase its resistance to disease. They haven’t reprogrammed them to make natural pesticides, or to recognize a wider range of pathogens. In a way, they’ve made it more vulnerable to certain viruses and fungi. That vulnerability will help the plant activate its response to a wide variety of invaders—and might save a lot of crops over the next few years. When plants get invaded by viruses, they don’t send their equivalent of white blood cells after the invader, like the human immune system would do. Instead they approach sickness the way cities do—by quarantining the affected areas. Deprive anything of nutrients long enough, and it will die. The trouble is, plants don’t automatically know they’ve been invaded. They have built-in sensor proteins that, when destroyed, will trigger the plant’s reaction, but there are plenty of pathogens that slip past those sensors. In the case of arabidopsis, a plant commonly used as a model by labs, its immune system is triggered when a particular kind of alarm protein is destroyed—usually when it is split by an enzyme commonly secreted by bacteria. This in turn alerts another type of protein that it’s time to go to battle against infection. The scientists wondered how they might tweak the genes to trigger the production of the destructo-protein in order to combat an invading virus (as opposed to bacteria). To do this, the scientists altered the plant’s genes in such a way that the alarm protein’s structure is modified in such a way that it can be split by a different enzyme usually put out by viruses. The result would be, ideally, what’s depicted in the picture above. 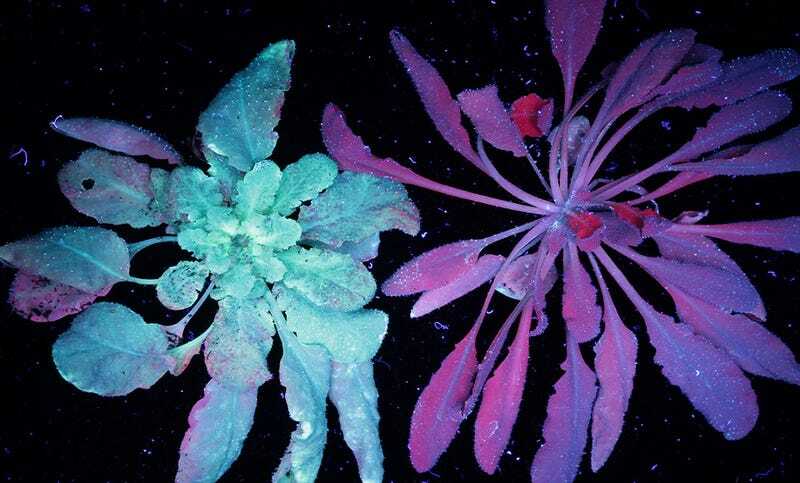 The plant on the left is infected with a turnip mosaic virus tagged with a fluorescent green protein. Three weeks after the infection, it still glows. The plant on the right is uninfected and a healthy purple, due to the chlorophyll in its leaves. Because a number of pathogens, including viruses, bacteria, and fungi, put out the same enzymes, it could be possible to make a wide variety of plants responsive pathogens to which they would otherwise have had no resistance.